South Africa will travel to the UK for their first international XV games since the 2014 World Cup. where they will take on the British Army as well as play an England selection in two other games. South Africa coach Eddie Myners has named nine capped national 15-a-side and Sevens rugby players in his 28-member squad for the team’s tour to England from 12 to 25 October. They will face the British Army in the first of three matches on the Saturday, which will be followed by clashes against the England Academy team on Wednesday, 18 October, and Sunday, 22 October, respectively. England have confirmed that the latter two games will be behind closed doors training games. The South African test XV programme has had a rocky few years with the union deciding not to enter the team into the qualification pathway for the last World Cup in Ireland and instead to spend the years between 2014 and 2017 on developing young players. There has also been recent controversy around its women's 7s programme, which lost its spot at the Rio Olympics after the South African Sports Confederation and Olympic Committee (SASCOC) applied their policy of not accepting Olympic places for teams if they only qualified via African continental routes, because in most sports they consider the competition to be "too weak" . 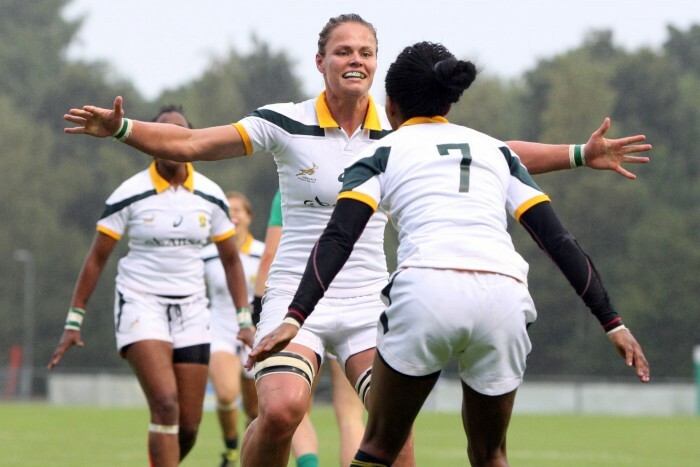 For this tour, Locks Celeste Adonis and Nolusindiso Booi, prop Asithandile Ntoyanto, and scrumhalf Fundiswa Plaatjie were all members of the 2014 Springbok Women’s Rugby World Cup squad, while all of the players with the exception of Ntoyanto also played for the Springbok Women’s Sevens team. Winger Nosiphiwo Goda, lock Rights Mkhari, flyhalf Kirsten Conrad, utility back Unathi Mali and centre Zinhle Ndawonda, meanwhile, all made their Springbok Women’s Sevens debuts in the last two seasons. “It is valuable to have these players among the youngsters and it contributes to a balanced squad,” said Myners. The team will depart for London on Wednesday, and while Myners is expecting a massive test, he is also excited to see what his team had to offer. “Our focus at this point is solely on our first match,” said Myners. “If we can get through that and earn the desired result it will certainly boost the players’ confidence going into the matches against the England Academy.